MET value – What does it stand for? It is also true that not only the best weight loss exercise program but even a single workout of moderate-to-vigorous physical activity, can reduce blood pressure, improve insulin sensitivity, sleep quality, cognition and reduce anxiety symptoms, on the day that action is performed. So, it seems that all comes down to being more physically active! It is recommended that a grown person have no less than 150 minutes of moderate aerobic or 75 minutes of vigorous activity per week. It's our choice to choose the type and level of physical activity which is appropriate for us, our fitness level and increases it over time. Before we start, let's clear up what the meaning of moderate or vigorous activity is? To help answer that, here's a theoretical explanation. While sitting for an hour in the standard office chair our energy expenditure and calories burned equals one-time resting metabolic rate or 1 MET (Metabolic Equivalent of Task) which is defined as 1 kcal/kg/hour and equals to the oxygen cost of sitting quietly, equivalent to 3.5 ml/kg/min. Put another way; the resting metabolic rate is an estimate of how many calories you would burn if you do nothing. Every activity has a "MET value" which calculates the energy required for that activity. Multiplying MET value by weight in kilograms tells us calories are being burned per hour. If you are 220 lbs (∞100kg) and walk briskly for an hour, you would burn between 300-600 Calories. Not bad! 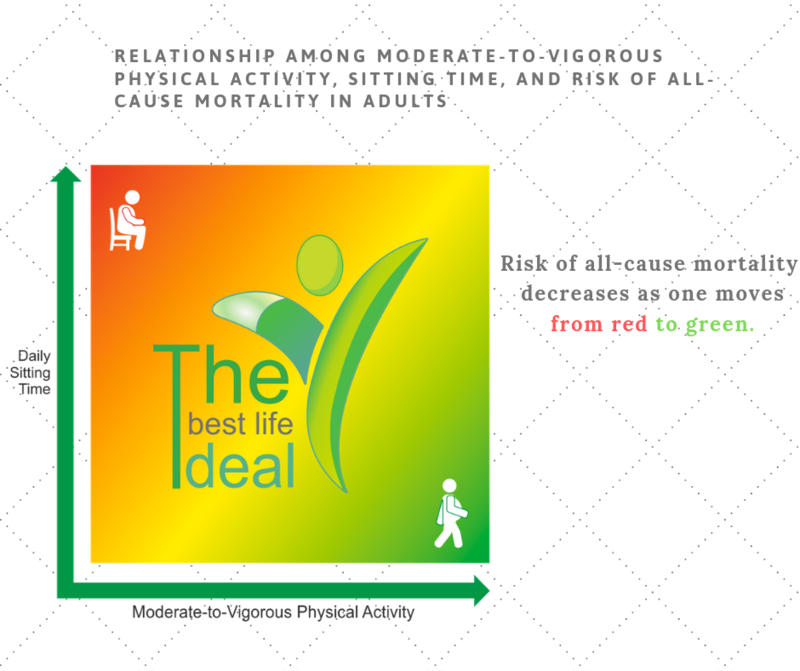 There are three main categories of physical activity level: low, moderate and vigorous Light-intensity activity is non-sedentary waking behavior with < 3.0 METs; examples are cooking activities, light household chores and walking at a slow pace. Moderate-intensity burns off three to six times as much energy per minute (3.0 to 6.0 METs) as you do when you are sitting quietly (1 MET). These are brisk walking, gardening, water aerobics, dancing, shooting a basketball, badminton recreational, and tennis doubles. Vigorous-intensity activity requires 6.0 or more METs and include running, playing basketball carrying heavy groceries, participating in a strenuous fitness class, single tennis, shoveling, and carrying heavy loads. If you agree that there is never a perfect time for anything, choose the amount and type of exercise which is best for you, and get started! This is one of the best things you can do for your body!